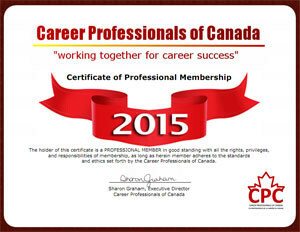 Career Professionals of Canada (CPC) is a uniquely Canadian member-driven association. Members represent all sectors and regions across Canada and include employment consultants, career coaches, resume writers, interview coaches, outplacement consultants, recruiters, and a wide variety of other career professionals. CPC members work together for career success! View From Good to Great! Attract and Retain Clients, a presentation Wayne developed and delivered on behalf of CPC for Cannexus14. Career Directors International (CDI) is more than a professional association… CDI is a brain trust of committed individuals who, every day, help career professionals to change their lives in very significant ways. CDI members span all career disciplines and represent a global community of those individuals who aspire to be leaders in the careers industry and to make a difference to the job seekers who they serve.